After the sort of long lead-up that can only accompany a once-every-four-years tourney, the World Cup will officially commence next week. Every sports angle's been dissected—which means we can turn to more important ideas, like the fact that the jerseys are, at long last, getting their official releases. And this go-round, undoubtedly the most exciting and anticipated of these jerseys belongs to Nigeria’s national team. The kits are a genuine fashion item: there are a couple versions but the favorite features an unripe-lime green in the body with white-and-black sleeves and jagged vertical stripes that are meant to resemble the wings of the team’s mascot, the Super Eagles (but look a little bit like Mario Kart turbo pads). The jersey looks less like a traditional soccer kit than a hyped-up sneaker—particularly the coveted Nike design seen on Acronym’s version of the Vapormax. And the response has been fitting: the jersey has been near-unanimously considered the coolest of this year’s crop ever since it was unveiled in February, and it’s turned from a piece of athletic gear to rarest-provenance streetwear. Since that February reveal, the jersey’s picked up an alleged three million pre-orders (more on that later), sold out at Supreme box logo speeds, and is now reselling like one of those BOGO tees on the secondary market. Every day ultra-limited sneakers and items from hyped up streetwear brands trade back and forth on secondary platforms like Grailed or StockX, but it’s unusual for a soccer jersey to find its way onto the secondary market. In a World Cup cycle that’s also seen themed releases from Virgil Abloh and Kim Jones, one of the coolest pieces of tournament gear is a regular-degular jersey. How did that happen? Great design, to start. But once everyone caught on to the jersey’s appeal—especially in comparison to something like England’s jersey, plain white with a badge on the breast, which was revealed alongside Nigeria’s kit—the shirt was sent through the hype machine. Twitter users were enamored with the jersey and started spreading images of it around, it got picked up on streetwear blogs, and was worn by grime star and stylish man Skepta months before going on sale to the general public. Then Nike came out and announced that three million people had already bought the jerseys before they were even released. As Quartz notes, analysts were skeptical of those figures since there wasn’t any apparent way to even buy the kits when that was announced—and three million is more than what Manchester United, the most beloved football club in the world, sold in all of 2017. Still, this didn’t stop the internet from going after these jerseys with serious hypebeast passion. The Nigeria jersey provides a case study in how the streetwear internet works in 2018: cool-looking object gets hyped up endlessly until its coolness is a fact carved into stone. We’ve seen this happen countless times, sure—just not usually with a soccer jersey. But it does feel about time for soccer to have a moment like this. Remember that just a couple years ago Drake Instagrammed himself in a pink jersey from the Italian club Juventus, bumping sales for that particular kit. And soccer has been the inspiration for other designers in the fashion world: Gosha Rubchinskiy collaborated with Adidas on several kits and labels like Versace and Burberry have taken inspiration from the sport in recent collections. When Abloh released his collection of soccer gear with Nike he noted how the sport had a defined visual identity. “The great thing about the vocabulary and history of football is that aesthetically it has its own look,” he said. 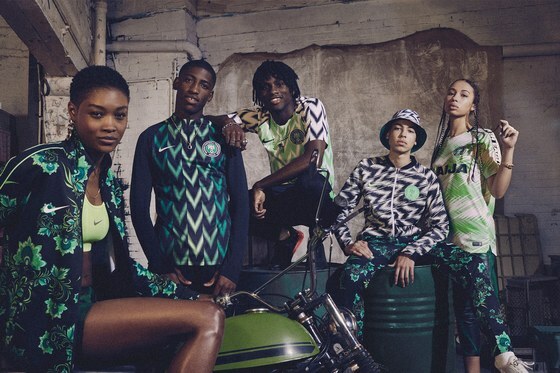 The Nigeria jerseys seem to tap into what designers already knew: soccer is fashion, or at least a sport worthy of being mined for fashion inspiration and turned into luxury soccer scarfs or streetwear-adjacent jerseys. And so why shouldn’t a team have jerseys befitting that status? When the Super Eagles line up against Croatia in Russia next week, they’ll certainly be the best-dressed dudes on the field. And if and when they make their exit from the tournament, they’ll be able to cushion the blow by flipping their jerseys on eBay.